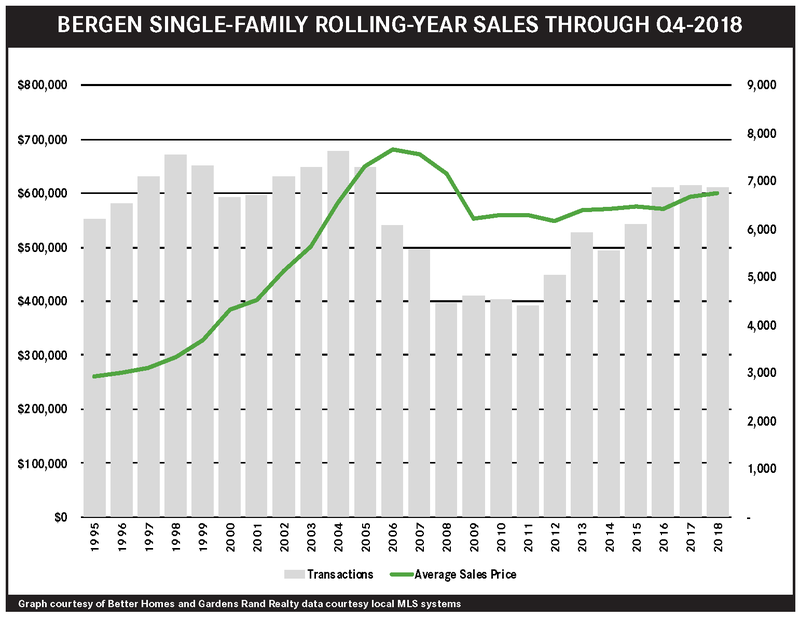 The Bergen housing market cruised through the second quarter, as low levels of inventory continued to stifle growth even while driving prices up. Sales were mixed: single‑family home sales were up about 3% from last year’s second quarter, but condo sales fell about 2%. For the year, sales in both houses and condos are down slightly, the result of inventory that’s fallen below the six‑month level that signals a seller’s market. But low supply and high demand is having its expected impact on pricing, with prices up for both property types for the quarter – rising about 4% at the median. 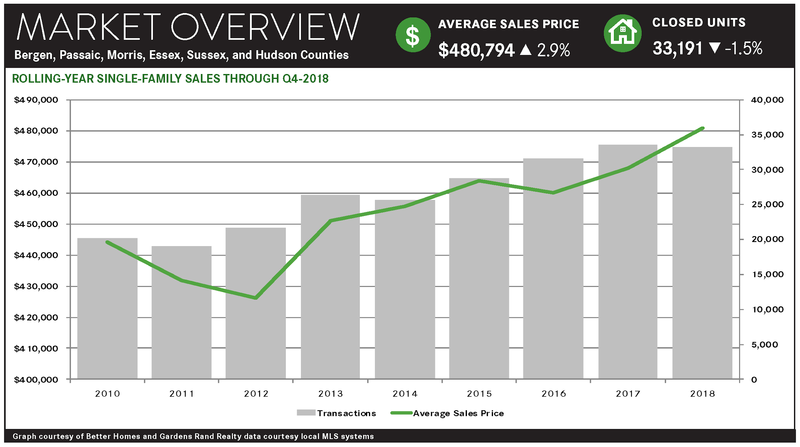 Going forward, we believe that inventory is starting to stabilize, but robust demand will continue to drive both sales and prices up above last year’s levels in a strong summer and fall market. The housing market in the Northern New Jersey suburbs of New York City continued to develop as a fully‑realized seller’s market, with low levels of housing supply shackling sales growth but generally driving price appreciation throughout the region. The regional market continues to suffer from a lack of supply. The number of homes available has settled at levels that generally signal a seller’s market, with about six months of inventory in most of the Northern New Jersey markets. The lack of inventory has been stifling sales growth, since the market lacks “fuel for the fire” to meet the existing buyer demand, even while driving meaningful price appreciation throughout the region. Because of the lack of inventory, sales were mostly flat. For the region, sales were up just 0.3% in the quarter, and they were mixed in the individual counties: Bergen houses up 3%, Bergen condos down 2%, Hudson down 3%, Passaic up 3%, Morris down 4%, Essex up 1%, and only Sussex bucking the trend by rising about 11%. That said, sales are now at levels we haven’t seen since the seller’s market of the mid‑2000s, and almost double in many places from the bottom of the market following the correction of 2008‑09. But even as low inventory stifles sales growth, it drives meaningful price appreciation. 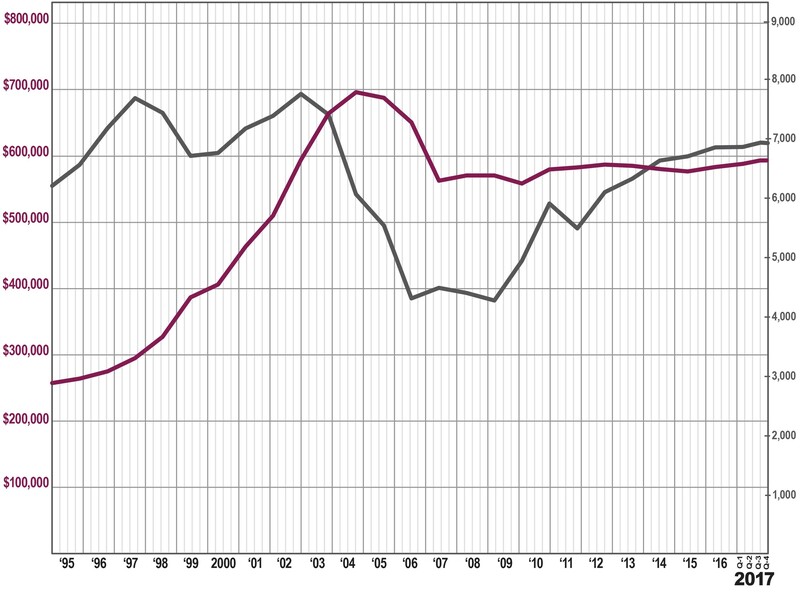 Prices rose about 2% regionally, with dramatic spikes in Hudson (8%), Passaic (6%), and Sussex (7%). Those types of increases are not sustainable, but the longer‑term trends are still meaningful, with regional average prices up about 2% for the rolling year. Inventory, however, might be stabilizing. Textbook economics tells us that limited supply, coupled with high demand, drives prices up, which is what we’ve seen in the past several years. But that same textbook also teaches us that rising prices eventually attract more sellers into the market, which fuels sales and stabilizes pricing. And that seems to be what we’re seeing now ‒ after several years of sharply declining supply, inventory either flattened out or even rose in some markets. Going forward, we expect the seller’s market to continue. Stabilizing inventory might drive more sales growth, but we still believe that demand is strong enough to soak up that added supply and still drive meaningful price appreciation. Accordingly, with good economic conditions, low interest rates, and attractive pricing, we expect that the Northern New Jersey market will see rising sales and prices through a robust summer and fall market. 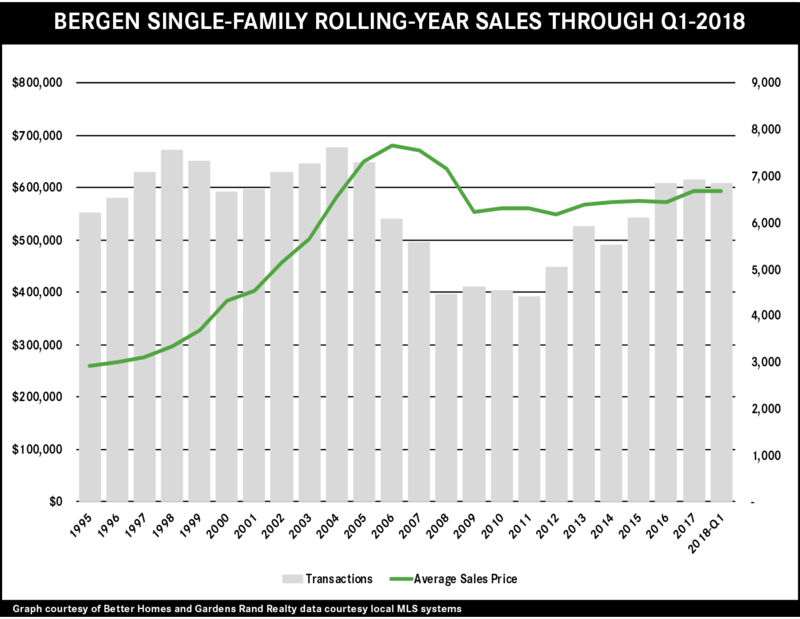 Growth in the Bergen market was stifled by a lack of inventory, which suppressed sales even while it drove meaningful price appreciation. Sales were down for both property types, falling 5% for single-family homes and over 13% in condos. This was not due to a lack of demand, but a lack of supply, as inventory fell again and is now well under the six-month level that usually signals a seller’s market. That drove significant appreciation, with single-family homes now up almost 3% on average and 4% at the median for the rolling year. This appreciation might start attracting more sellers into the market, which would ease the inventory shortage. But that will not happen in time for a spring market, which will be marked by low inventory, stifled sales, and rising prices. 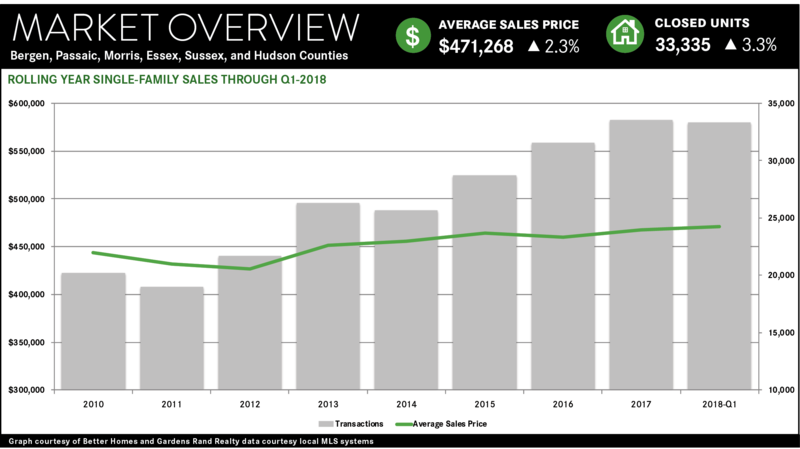 The housing market in the Northern New Jersey suburbs of New York City has become a fully‑realized seller’s market, with declining inventory stifling sales growth while driving meaningful price appreciation throughout the region. The regional market continues to suffer from a lack of inventory. The number of homes available for sale compared to last year fell sharply in every market in the region. At the current absorption rate, we are now down to well under six months of inventory in every county for single‑family homes (other than Sussex), which usually denotes a seller’s market. But with all this demand chasing fewer homes, prices are up significantly across the region. The regional average sales price was up over 5% in the quarter, rising for every county and property type, particularly in the markets closest to the city: Bergen was up 1% for single‑families and 19% for condos, and Hudson was up 6% for single‑family, 21% for multi‑family, and 11% for condos. This type of double‑digit appreciation is not sustainable, but the long‑term trend for the rolling year is still very positive, up about 3% for the region and rising in every county except Sussex. Going forward, this is what a seller’s market looks like. Low levels of inventory will continue to hold sales back even while driving prices up. At some point in 2018, this price appreciation will attract more sellers into the market, which will increase supply, bring sales up, and maybe moderate price increases. But that will not happen right away, so we expect a spring market with even lower levels of inventory, which will stifle sales growth but continue to drive robust price appreciation. 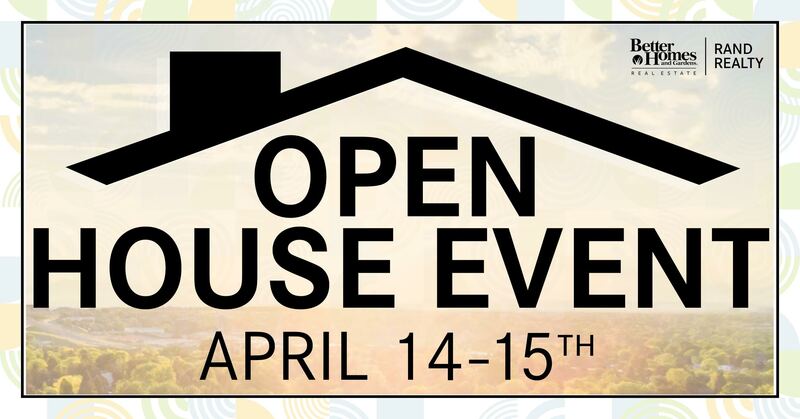 NANUET, NY – Better Homes and Gardens Rand Realty is excited to announce that they will be holding an open-house event, where attendees can receive advice on buying and selling homes. It will take place on Saturday, April 14, and Sunday, April 15, from 12:00-4:00 p.m. on both days. All 27 of Rand Realty’s sales offices will be participating in the event, with listings located throughout the Lower Hudson Valley and Northern New Jersey. At these sites, attendees can engage with an agent for one-on-one assistance on how to conduct a home search or market their home for sale. They will also have the opportunity to enter a raffle to win a gift basket, with one being provided by each of the four regions that Rand Realty serves: Rockland, Orange, and Westchester Counties in New York, and Northern New Jersey. Better Homes and Gardens Rand Realty, founded in 1984, is the No. 1 real estate brokerage firm in the Greater Hudson Valley, with 28 offices (including a corporate location), serving Westchester, Rockland, Orange, Putnam, and Dutchess Counties in New York, as well as Bergen, Passaic, and Morris Counties in New Jersey. Better Homes and Gardens Rand Realty has over 1,000 residential real estate sales associates, as well as a commercial real estate company (Rand Commercial) and the Hudson United Group, which provides residential mortgage lending, title services, and commercial and residential insurance. These companies can be found online at www.RandRealty.com, www.RandCommercial.com, and www.HudsonUnited.com. Better Homes and Gardens Rand Realty can also be found and interacted with on Facebook, Twitter, Pinterest, and Instagram. The Bergen County housing market slowed a bit in the fourth quarter, but still finished the year with meaningful price appreciation and remarkably low inventory levels. Sales. Home sales were down slightly, falling over 4% from the fourth quarter of 2016, which marked the first quarterly decrease in sales in over three years. And for the year, sales were basically flat. 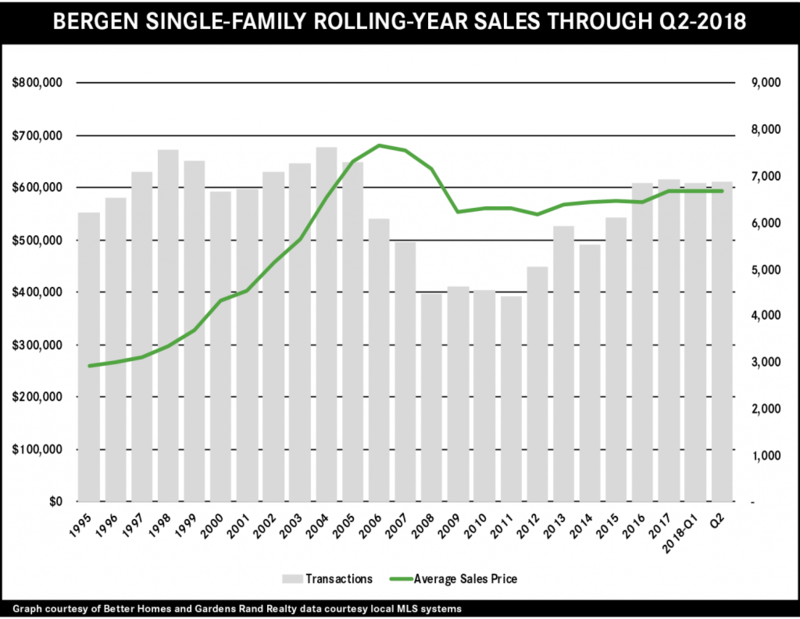 That said, the near‑7,000 single‑family sales in 2017 was the highest number of transactions since the height of the last seller’s market over 10 years ago. What’s holding sales back right now is not a lack of demand, but a lack of inventory. If we start seeing more homes hit the market, we’ll see sales go up sharply. Prices. Single‑family home prices were relatively flat after a torrid third quarter, falling just a tick on average and up about 2% at the median. 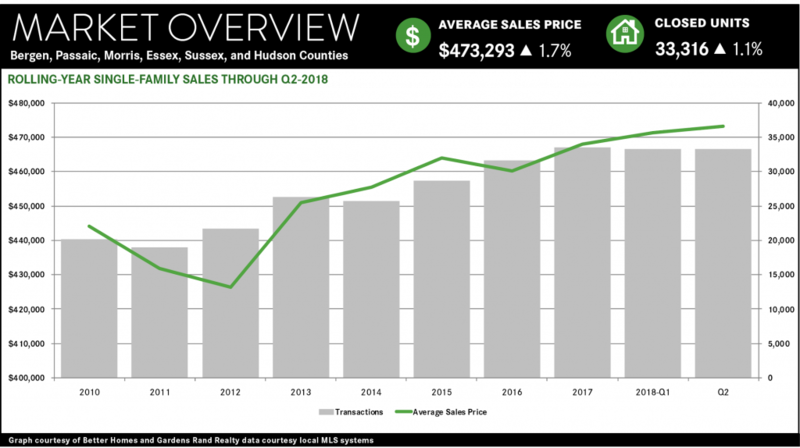 Over the year, though, we are seeing the impact of declining inventory and strong demand, with prices up about 4% on average and at the median. Negotiability. All the negotiability indicators are also signaling a rising seller’s market. Inventory continued to tighten in the fourth quarter, with the months of inventory falling almost 5% and now down to well under four months. Anything fewer than six months starts to signal a seller’s market, and we are now way below that level. Similarly, homes are continuing to sell more quickly and for closer to the asking price. As inventory continues to tighten, we would expect to see sellers gain even more negotiating leverage. Condos. Activity in the Bergen condo market was flat in the fourth quarter, and prices fell about 2%. For the year, sales were up about 5% and prices down just a tick. With inventory now down to about four months, though, we would expect to eventually see some meaningful price appreciation. Going forward, we expect Bergen County will experience a robust 2018. 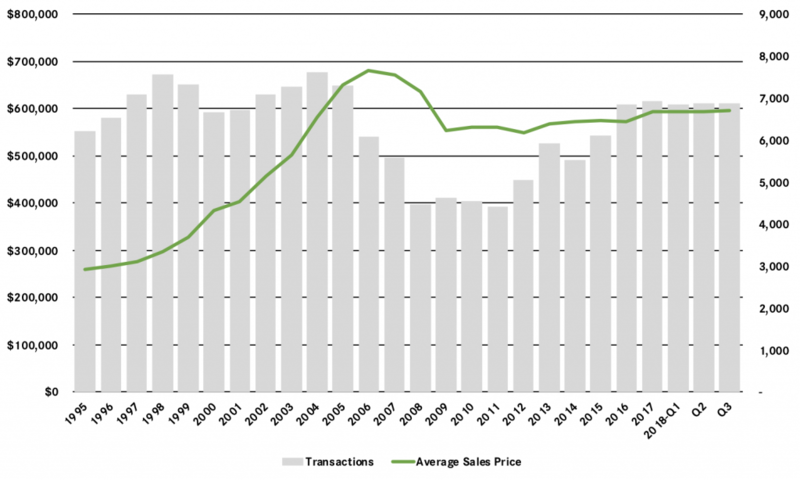 With inventory tightening, a relatively strong economy, near‑historically‑low interest rates, and prices still at attractive 2004‑05 levels, we believe that sustained buyer demand will continue to drive meaningful price appreciation through the full year. And those rising prices will likely tempt more homeowners into the market, which will drive sales up to even higher levels.